This is Part One in a series about Chicago’s Experimental Film Coalition; and covers the organization’s inception. 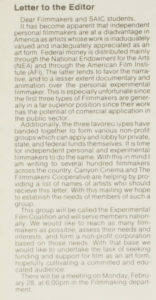 In 1983, a group in Chicago, Illinois formed the Experimental Film Coalition to promote and provide support for independent, avant-garde, experimental and underground filmmakers. In their hometown, the Coalition hosted monthly screenings, founded a long running film festival and published two periodicals during their decade-plus existence. The first public mention of the Coalition appears to be in a “Letter to the Editor” in the February 25, 1983 edition of Crumbs, a student publication at the School of the Art Institute of Chicago (SAIC). As of this writing, the Journal has not uncovered the identity of that letter’s writer (or writers), nor the attendees at that meeting, nor even if the meeting occurred at all. However, filmmaker/artist David Koblesky recalls discussing the need to show more experimental films in Chicago with John Luther Schofill, a professor at SAIC. In 1980, Koblesky had received a B.F.A. at Southern Illinois University (SIU), where one of his professors was experimental filmmaker Mike Covell. SIU and SAIC enjoyed a close relationship, so after graduation Koblesky moved to Chicago and began talking with Schofill about starting an experimental film screening series. Another person involved with the group in the early days was Sharon Couzin, who was teaching at SAIC in 1983 and had been since 1978; after receiving her B.A. there in 1976 and her MFA in 1977. Couzin began making films in the early 1970s, including Roseblood (1974), an experimental dance film, and Deutschland Spiegel (1980), which combines German newsreels and personal footage. Couzin would later become the Coalition’s President and serve until 1988. It is not known if E. Jay Sims was involved in these early days, but she would serve as the Coalition’s Communications Coordinator from 1986 to 1989. Part Two in this series covers the Coalition’s monthly screening program.